Being able to draw cartoon characters is just one part of the cartooning equation. 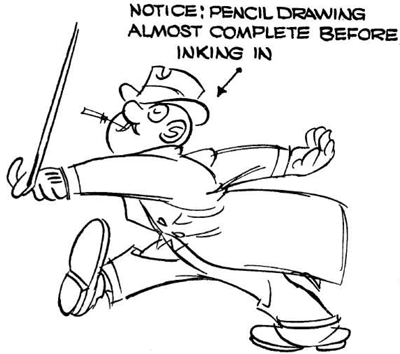 You also must know how to draw the comic figure in action and in motion. Today, we will learn how to draw a cartoon man, strutting / marching down the street, twirling his cane around his finger, and about to slip on a banana peel. 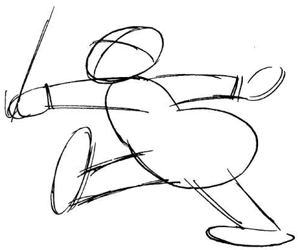 Learn how to draw the cartoon action / motion lines and comic gimmicks by following this tutorial carefully. First, draw the basic shapes that make up the character. Draw slanted oval for the head (draw the criss-cross guidelines within this oval). Draw a capital letter ‘B’ for the man’s body. Draw rectangles for arms and legs and draw ovals for hands and feet. 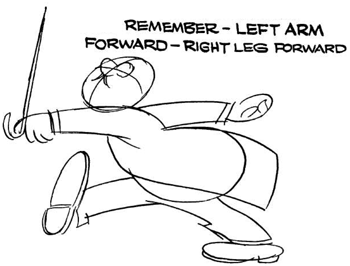 When somebody is walking or marching and their right leg goes forward, then the left arm goes up as well. So always remember that the opposite arm moves forward (than the foot that goes forward). Now we can start drawing in the details of the man. Draw the eyes (a sideways number ‘8’ like shape) at about the point that both guidelines criss-cross. 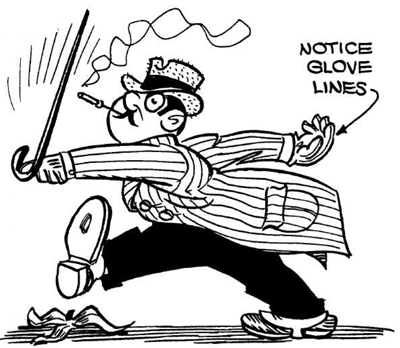 Start drawing in the fingers, the coat, the cane, pants and shoe details. 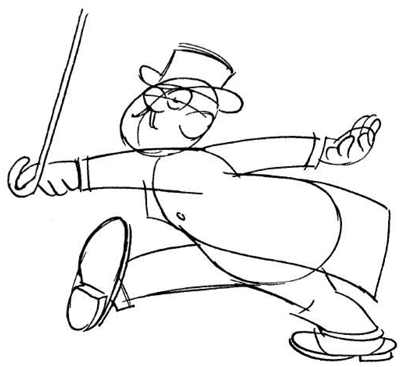 Start drawing the man’s top hat by drawing a figure ‘8’ shape for the rim with a cone-like shape at the top of the head. Draw in the nose (a letter ‘c’ like shape. Draw the pupil / iris in their too. Draw the ear (a backwards letter ‘c’ shape) at the right of the eyes and nose. Draw a letter ‘s’ in the man’s ear. Draw buttons on the coat. Erase the guidelines within the oval face. Draw wrinkles in the man’s pants. The drawing is almost complete other than the shading and coloring in with pen and ink. 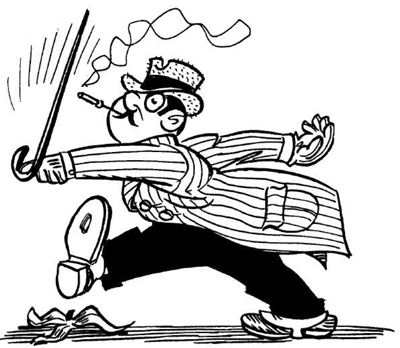 The man is twirling his cane in a very confident matter (which is why it will be funny when he falls – since he seems like he might be obnoxious). 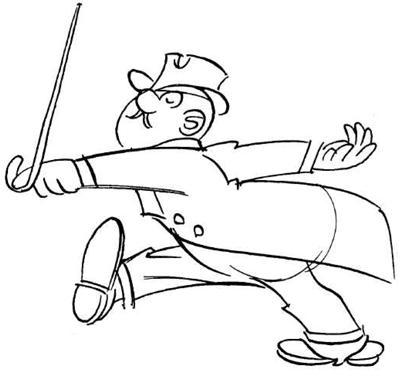 To show that he is twirling the cane, draw action lines around it. He is also smoking a cigar, show the smoke coming out from the cigar. Notice the hole in his shoe too. Draw the banana peel too. Now just erase lines that you don’t need and outline the ‘correct’ lines with a black pen or marker. Making thick, interesting lines instead of the thin pencil lines makes quite a difference in the end result, doesn’t it? If you are having problems figuring out which lines to erase, then reference my drawing (above) for help. Now you will have an amazing cartoon drawing of a humorous comic character about to fall on a banana peel, to show off to your friends.